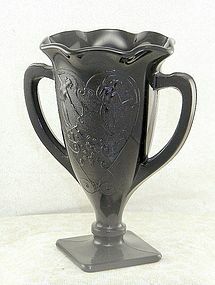 This lovely black trophy vase is by L. E. Smith from the 1930s. It features a large heart shape cameo with two women dancing with scarves. The rim is ruffled and it stands in a square foot. This ebony vase stands 7 1/8" tall and 4 1/2" across the ruffle rim; it is in excellent, unused condition. Insurance and confirmation are included in the price.